Pacific Rim is flashy. It's bright. It's colorful and has a lot of big bangs and explosions. It also has piles of clichés, stock characters, and for me, an almost cynical view of its audience. 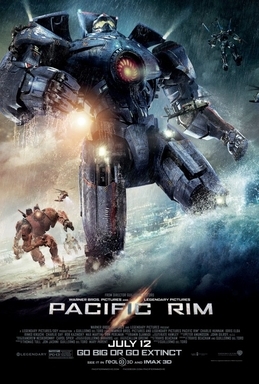 I watched Pacific Rim and was disappointed: I think it could have tried something more original, created its own world. However, Guillermo Del Toro opted to use things we've seen before, throw it all together and voila: a potential franchise. Kaiju (or Giant Beast) have begun attacking Earth, having come from beneath the Earth. Humanity has put aside all its differences to unite against this common foe, and we now have the Jaeger (the Hunter), large machines that fight on our behalf. The war continues for some time, to where the Jaegers and their pilots are seen as the new rock stars. Among said stars are the Becket Brothers, Yancey (Diego Klattenhoff) and Raleigh (Charlie Hunnan, the once and former Christian Grey). However, the Jaeger Masters suffer a brutal loss while fighting a Kaiju off Alaska. Disobeying Marshall Stacker Pentecost (Idris Elba), these hotshots do defeat the Kaiju, but Yancey is killed and Raleigh barely survives. Time marches on, and the decision is made to terminate the Jaeger Program because the Kaijus have consistently grown more powerful after each wave of attacks. Instead, a giant wall will keep the Kaijus out. Pentecost has a daring plan: drop a nuclear bomb at the entrance where the Kaijus enter the Pacific Rim and asks the now-construction worker Raleigh to go back to the Jaeger that cost him Yancey and drop the bomb. Reluctantly, he goes and is taken to Hong Kong, the last vestige of the Jaeger Program. Raleigh instantly falls afoul of hotshot Aussie Jaeger pilot Chuck Hansen (Rob Kazinsky), though Rob's father, Herc or Hercules (Max Martini) knows Raleigh is good. Also there is Mako Mori (Rinko Kikuchi), a Japanese prodigy with a shattered past. The Jaegers operate by tying the minds of their pilots, which also means tapping into every memory they have. This is why family members appear the best at piloting them. However, Raleigh has no family, so who to be his co-pilot? One guess...he'll be turning Japanese. There are also two scientists, Herman Gottlieb (Burn Gorman) and Newton "Newt" Geiszler (Charlie Day) are working apparently at odds to come up with other ways to defeat the Kaiju. Newt is a fan of the monsters, which disgusts Gottlieb. Newt believes that just as the Jaegers can mind-meld, so can Kaiju. However, what if Kaiju and Human can share thoughts? Only one way to find out. Well, Newt manages to do it, which nearly costs him his life but allows him to gather important information. Pentecost sends him to contact the mysterious Hannibal Chau, who finds fresh Kaiju remains that Newt can use. Chau (Ron Perlman) doesn't like Newt's idea...because he knows it will allow the Kaiju to read human minds too (somehow, he knows what comes from this). The Kaiju do indeed go after Newt, but Chau saves him...at a cost to himself (or is it?). Mako proves herself a bad choice, getting lost 'chasing the rabbit'. She relives the horror she witnessed at the hands of the Kaiju, with Raleigh desperate to lead her back. The center is nearly destroyed because she loses control, which angers Chuck so much he and Raleigh fight. Still, when yet another attack on Hong Kong leads to the Aussies coming close to death, it is Mako and Raleigh to save them. Now, with Chuck left an orphan, it is up to Pentecost, who know knows he is a dying man, to go down to the sea and wipe out the Kaiju. However, Newt and Gottlieb manage to discover that the military plan can bring the end of civilization itself, so all together they come up with a variation on the plan that saves humanity. ﻿I think my disappointment with Pacific Rim is its total unoriginality. We start with the Jaegers, these massive machines that are piloted by humans to defeat aliens. 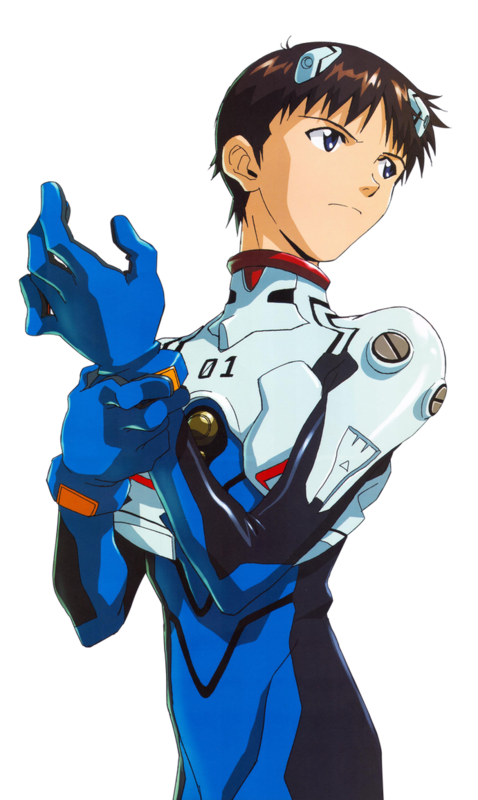 I can't shake the idea that Del Toro (who co-wrote the screenplay with Travis Beacham) were at the very least drawing inspiration from Neon Genesis Evangelion, the legendary anime series that has a similar premise. The only major differences between the two were that the Evangelions were piloted by teens rather than adults...and that the complicated emotional lives of the pilots (Shinji's desperate need for his father the NERV Director Gendo Ikari, the mysterious brooding of fellow pilot Rei Ayanami) were as much part of the story as the attacks. Pacific Rim, on the other hand, gives us instead stock characters (emotionally wounded girl, arrogant nemesis, wacky scientist, rebellious but heroic pilot, shouty leader) who do things we expect them to do (come to terms with their loss, rescue others at the last minute, provide comic relief). The arc of the characters is rote, with nothing in them to have us actually care about what happens to them. I could never shake the idea that Pacific Rim was a Part II without knowing anything about Part I. The long voice-over that tells us the story up to where Raleigh loses his brother could be a movie unto itself. It's like jumping into something without fully knowing or caring about either the characters or situations. Not having seen Sons of Anarchy, I cannot say how good Hunnam is as an American-sounding person, but by the end of Pacific Rim his native British accent was slipping more and more, as if even he no longer cared. As a side note, for someone who thought Fifty Shades of Grey was beneath him...I thought Elba did a good job with the material he was given, but apart from him everyone didn't bother to try to elevate the material. Day's comic relief wasn't irritating, but his subplot was distracting and made the film longer. A lot of Pacific Rim is simply trying too hard to be 'epic': the performances, the music, the story (such as it was). It was for me trying too hard to fit into a certain mold of big, loud, action-packed event films but which left me cold. I grant it had nice things in it: the colors were pretty and it has great special effects. However, a prime example of what I disliked about Pacific Rim is what is suppose to be a climatic moment: the dropping of the bomb on the Kaiju. Everything in it is beautiful to look at (the actors, the scenery), but everything is so clichéd: the angry leader sacrificing himself, the cocky rival who accepts at the end the other guy's not so bad, the girl who realizes that she can overcome and what she feels for the hot but somewhat aloof hero. Despite everything in it, there is nothing original in Pacific Rim. Having just watched and reviewed the film myself (I probably won't post the review until next week), we have vastly differing opinions on one key area: the similarity to Neon Genesis Evangelion and mecha anime in general. NGE is one of my favorite and seeing basically a live-action version of it is one of the major reasons I enjoyed Pacific Rim. Granded, the film has many problems, particularly the arrogant bully type character as you pointed out. However, seeing such an anime inspired big budget live-action English film is the reason I enjoyed it so much. I never expected to see something like it, but I understand your viewpoint and dislike of the film. I think the Honest Trailer parody says it best, "Pacific Rim is the best dumb ever" or something to that effect. By the way, have you ever reviewed any anime? I would be interested in reading anything you may have written about it. The only anime that I've reviewed was Akira as part of The Essentials, a temporarily suspended series of film reviews my friend and I were collaborating on. I also love Evangelion. I thought there was going to be a live-action version made, but haven't heard anything recently.